Although it took me longer then I thought, I finally finished Words of Radiance the second novel in The Stormlight Archive. I really enjoyed the first book Way of Kings but it had a really slow start. The same can not be said for Words of Radiance. It picks up right where the last book left off and then just hits the gas pedal for over 1,000 pages of amazing fantasy writing. What I love about Brandon Sanderson is that he has a very clever way of building his worlds. He isn't abrupt about it. He builds his worlds through his characters and that's what really stood out for me with Words of Radiance. The main protagonists in Words of Radiance feel more alive and real. I still tend to think they're written to be a little "too perfect" for my taste, but there are some gray areas that pop up throughout Words of Radiance. The biggest compliment I can give Words of Radiance though is that it kept me excited to keep reading. My sister had finished this book a couple months prior so I would text her any time something major happened which tended to be at least a couple of times a week. That is not something I can say about many other books out there. 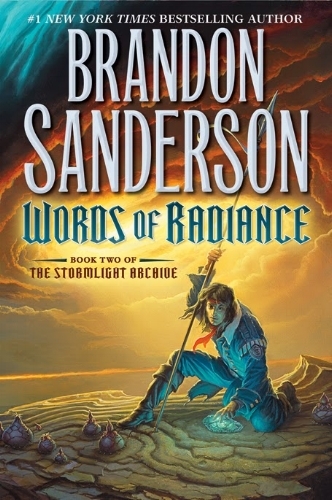 What I worried about most was that Words of Radiance would feel like a small step forward in the overall progression of the story, but instead, it felt like a giant leap and I have no idea how Brandon Sanderson has so much story still left to tell. But as I think about wading into the third book I can tell you that I can't wait to see where everything ends up because this is starting to become one of my favorite fantasy series of all time.